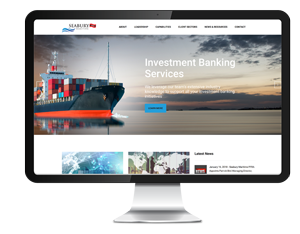 NEW YORK – May 1, 2018 – Seabury Maritime PFRA (“SMPFRA”), a premier investment banking and consultancy firm focused on global trade and transportation, and a division of New York-based Seabury Capital LLC (“Seabury Capital”), announced today the launch of a new website: www.seaburypfra.com, providing comprehensive information on the company’s service offerings. “The global trade and transportation industry is undergoing rapid transition and business leaders are seeking out solutions to enable their companies to adapt for success and to maintain sustained competitive advantage,” said Seabury Capital Chairman, President & CEO John E. Luth. SMPFRA’s integrated platform, which delivers an end-to-end solution for maritime-oriented transportation investment banking and consultancy needs, capitalizes on the company’s distinctive processes and methodologies, as well as core competencies deeply rooted in the maritime, ports, transportation, and logistics sectors. The platform also provides industry-leading market databases and business intelligence tools across all segments of the cargo industry. SMPFRA had been engaged in assignments for a variety of stakeholders worldwide, including international and domestic corporations, ocean, air, motor & rail carriers, port authorities, terminal operators, labor unions/management, financial institutions, beneficial cargo owners, infrastructure developers, government agencies, and legal counsel. To learn more about SMPFRA’s service offerings and capabilities, visit www.seaburypfra.com or access it via Seabury Capital’s corporate website at www.seaburycapital.com.